Japanese, Thai and Chinese all fused in the same restaurant. Featuring fresh Susi, Soups, Salad, Seafood and much more. Home of the ever popular Volcano Roll. This restaurant is on a fast track as a local favorite. Located in the Surfrider Plaza on SR 9 towards Longs SC. I think it is normal to only write reviews when service is poor, so I wanted to take the time to say this place is great! Priced well and service is wonderful. We eat there frequently and always enjoy the hibachi. Horrible Horrible Horrible. Don't Go there.. I went and had a coupon for buy one get one entre half price, and it was happy hour time, I had two beers on their happy hour and then when we went to check out they said we cant use the coupon at happy hour. It stated nothing of that, and I gave it to her before we ordered. They lost a customer over $4.00. Terrible service, all the food has too many onions.. worse service than anywhere I have been. If you like rubberized sushi, this is your place. The term fresh does not apply here. There are better places if Asian cuisine is your choice: Thai Seasons is one where quality means something. Avoid Jay's at all costs!!! Food is good for the area. Service is terrible due to language barrier. Ordered shrimp panang and got the completely wrong order on two separate occasions! Services are slow and the food is so-so. Prefer go to sushi buffet restaurants in Myrtle Beach. Most of the places in our area that serve Asian food are awful. Jay's Asian Fusion is a bit out of the way, but the quality and variety of the food makes it worth the drive. Have been there for lunch several times, enjoyed it, and recommended it to neighbors who also had a good experience. Have only ordered from the deli side and never from the resturant. But they are very slow when taking and getting orders ready to go. the food is good and so are the deli meats, but they are slow on waiting on customers. Call ahead if you can cause you can't if you are on your lunch hour and want to oder and run you will have a hard time. Best food in the area period. 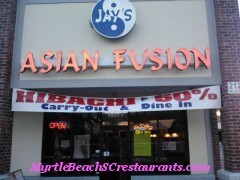 If you need quick service and great food go to Jay's Asian Fusion. Food was excellent and service was fast & friendly. Love this restaurant, we go there often, Delicious sushi, best in this area. Highly recommend it! I enjoy this restaurant a lot, not many good Japanese restaurant's in the Little River/Longs area. Their prices for the amount of food you get it a bit high but not too pricey. They are also owners to the Hong Kong restaurant in this area which has decent Chinese food. The sushi is probably the best variety that you can get in the area. Menu has a lot to choose from, sometimes confusing. I recommend the Singapore Noodles and the King Dragon roll. If ever in the Longs area and have the taste for Japanese,Thai,Chinese go here. Absolutely LOVE this restaurant...the sushi is excellent and has a beautiful presentation. I was actually debating whether or not to post a review because this little gem of a dining establishment is not very well known as it is fairly new and I get a little protective of places I love...! Anyways, not to share would be a shame. There is a wide variety of asian foods and the service is very good. I highly recommend this place for any occasion.